This is icing on the cake. I couldn't ask for anything more. I feel like crying right now ... 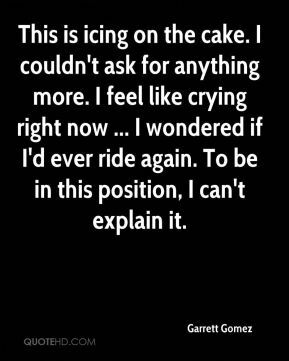 I wondered if I'd ever ride again. To be in this position, I can't explain it. He came up firing but them came up empty. 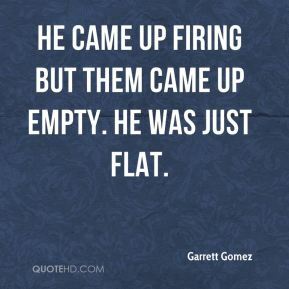 He was just flat. 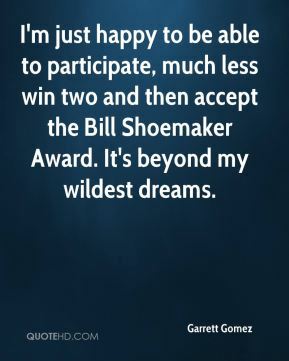 I'm just happy to be able to participate, much less win two and then accept the Bill Shoemaker Award. It's beyond my wildest dreams. 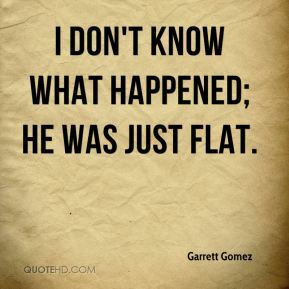 I don't know what happened; he was just flat. She handled the track OK, but she wasn't skipping over it. I let her settle and took my time. 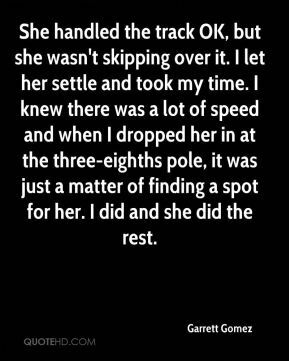 I knew there was a lot of speed and when I dropped her in at the three-eighths pole, it was just a matter of finding a spot for her. I did and she did the rest. 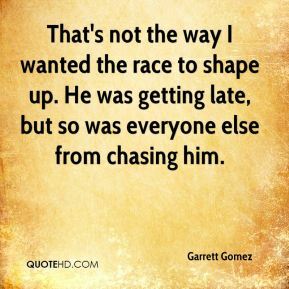 He ran a good race. 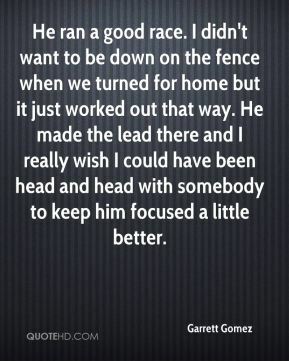 I didn't want to be down on the fence when we turned for home but it just worked out that way. He made the lead there and I really wish I could have been head and head with somebody to keep him focused a little better. That's not the way I wanted the race to shape up. He was getting late, but so was everyone else from chasing him. This was the first time he was running against these kind of horses, and he had been off for a while. With the combination of the two, I really didn't know what to expect. 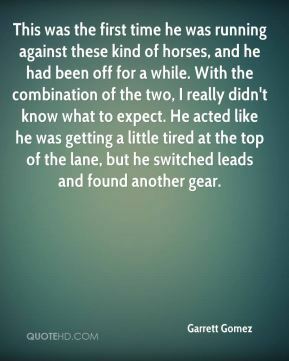 He acted like he was getting a little tired at the top of the lane, but he switched leads and found another gear. He's got phenomenal speed. 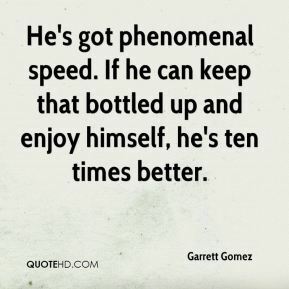 If he can keep that bottled up and enjoy himself, he's ten times better. 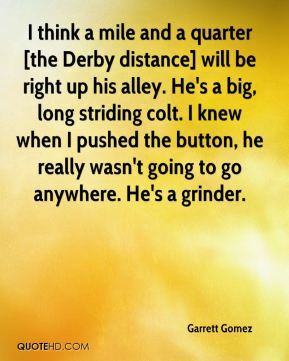 I think a mile and a quarter [the Derby distance] will be right up his alley. He's a big, long striding colt. I knew when I pushed the button, he really wasn't going to go anywhere. 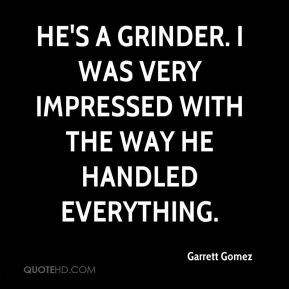 He's a grinder. He's a grinder. I was very impressed with the way he handled everything. He was a little throttled up from laying over on the field and I had his mouth gagged over going into the first turn. Once I headed up the backside I just kind of let him out a notch and tried to just get him to find his stride and get comfortable. To picture him doing what he just accomplished? No. 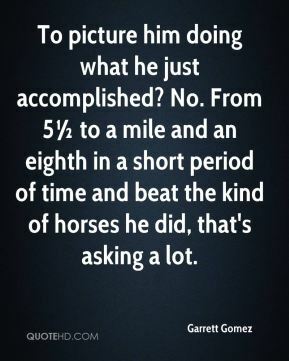 From 5½ to a mile and an eighth in a short period of time and beat the kind of horses he did, that's asking a lot.